Talk about too little, too late. 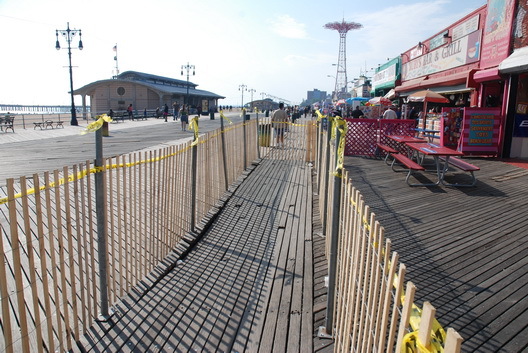 City Hall has finally come up with a plan to fix the decaying Coney Island Boardwalk — but work won't likely begin until after the busy summer season, and will only focus on two-and-a-half blocks in the main amusement area. "By that time it will probably have collapsed," quipped Coney Island regular Dianna Carlin, who runs the kitschy beach shop Lola Staar, and has seen visitors trip on the broken planks, gaping holes and protruding nails outside her store. "It's horrific. We fix the boardwalk ourselves so people don't injure themselves," she added. "There's a huge hole outside my store that's been gated up for at least six months." The city's new plan also calls for replacing a portion of the iconic wooden boardwalk with a mix of concrete and a synthetic material meant to look like wood. Under the city's plan, workers will begin replacing the worst stretches of the aging boardwalk between W. 12th and W. 15th Sts. this fall. Another story details some of the lawsuits. Last year's mess led to 10 suits for injuries caused by holes, broken boards and protruding bolts and nails. Several people have actually fallen through the rotting wood. In 2006, one claim was filed and five were filed in 2005. One suit is for $2 million.